As a woman of smaller stature, one of my challenges is finding gear that fits me well. At 5’4″ I don’t think I’m all that small but there are some items that I often have trouble finding a good fit for. Sunglasses are one of these items. One of my very favorite things is being in the high alpine. Big days, bright sun and lots of snow equals lots of eye strain and I decided to invest in a better pair of alpine sunglasses. 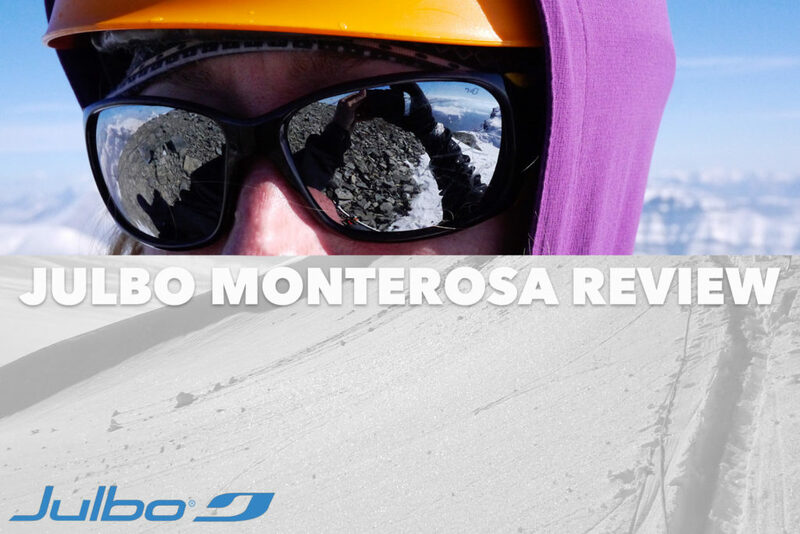 The Julbo Monterosa’s quickly rose to the top of the pack when I was trying them on. Gen high up on Mt. Victoria, Canada. The woman specific frame design fits my small face snuggly and not only keeps the harsh sun and reflective rays out, but also does a great job of keeping the wind and blowing snow out too! The Spectrum4 lens offers Julboʼs highest level of light protection, with only 5% light transmission. Iʼve worn these on my sunrise to sunset Mt. Forbes and Mt. Victoria North trips and on Mt. Athabasca, high in the glaciated and snow covered alpine, with very little eye fatigue. I could really notice a difference from my old $60 polarized sun glasses, even though they were also a very good fit and quite dark as well. The brightest environments I found are no match for the Spectrum4 lenses. Although they are not polarized, the lenses have great optics. Because they are so dark, the manufacturer recommends against wearing them for driving. Things seem dark in cloudy conditions, so carry an alternate pair with you or upgrade to the photochromic lens called Cameleon that adjusts automatically according to the amount of sunlight. These would be ideal for extended mountaineering trips, like my Columbia Icefields Expedition. The removable temple side-shields keep out stray sun rays and wind and snow alike, keeping my eyes well protected. There is no gap at the eyebrows, and the frame hugs my cheeks nicely. This is especially great for me since a good fit is the biggest obstacle I have in finding a good pair of glasses. Frames are usually too big for me, letting light sneak in on the sides, Additionally, these stay put without slipping, and peripheral vision with these frames is so good, I sometimes forget Iʼm wearing them! Although I prioritize function over style when it comes to my mountaineering sunglasses, these do have a good looking sporty design, and come in a variety of colors. Included in the purchase is a protective case, a soft pouch, and securely attaching lanyard. One great thing is that if you lose or damage a component of your glasses, replacement parts are available for order. I recommend these glacier sunglasses to ladies who are not satisfied with the fit and protection offered by unisex/menʼs frames. The best environment for these lenses is the high snowy and glaciated alpine terrain; the brightest environments where protecting your eyes from the rays is a top safety priority. The highly reflective lens also makes for very cool close-up shots! Great protective fit, best sun protection, comfortable, fair price point. Very dark and not suited for cloudy conditions. Supplied lanyard I found to be uncomfortable under my helmet. We are also reviewing four other Julbo products, so watch for more reviews. These were designed in collaboration with the elite climbing school of Chamonix. The Explorer takes glacier sunglasses to the next level: lenses with impressive protection, bendable temples for a perfect fit, full coverage against damaging UV rays, and an anti-fog ventilation system. Ian has worn these on a few trips including a summit attempt on North Victoria. He’s been thrilled with them so far. The reduction in eye-strain and clarity of the lenses is great. Gen and a couple other female testers tried them but found they were not a fit for small women’s faces. The Tensing is equipped with the same quality lens (Spectron 4) as the more expensive Explorer model for HALF the price. Ian has been wearing these all over the place. He thinks the combo of the lens, durability of the frame and the cost are hard to beat. Especially for a guy that’s hard on his gear. Gear editor, Maarten got these and doesn’t want to give them back. They were his constant companion during his rock climbing guides exam and are now in Morocco with him. We are super excited to be testing the Aerospace Googles. They have been winning rave reviews and we just can’t wait to get them out into the Backcountry. Here’s a video explaining their design and the superflow air system.